I have been using the AB040 since 1997. I had a lot of problems at first mostly due to the fact that my AB040 is an early release. I had to fully redo my clock circuit using a 74ABTxxx buffer circuit. I also replaced the original 68040RC25 with a 68040RC33. My flacon also had the original 68030 removed (so no going back). I also discovered that if your TOS is set to another language than GB/USA or GER, the AB040 TK drivers crash a lot. Once I switched to GB it's a lot more stable. I was even able to do some tests at 50MHz, but the blitter kept locking up before the system had time to switch it off from the auto folder (the falcon use the Blitter to display the Atari logo at boot). It used to be overclocked to 20/40 MHz. 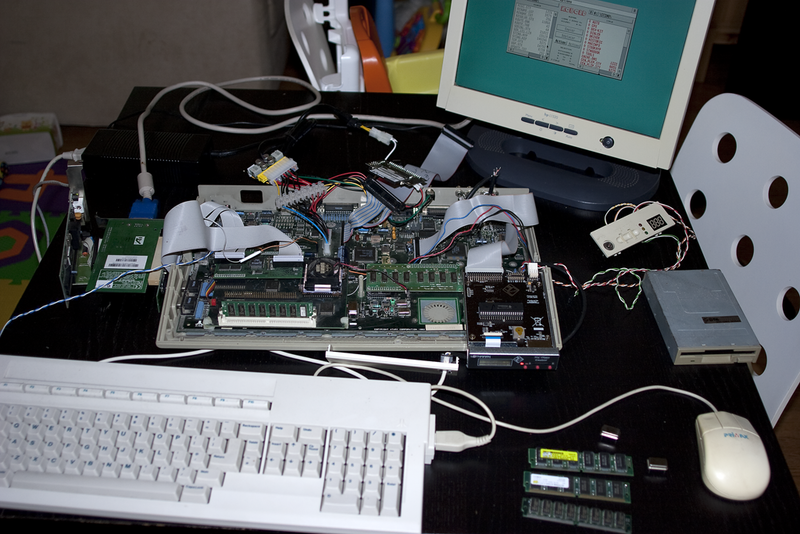 But due to some issue with the floppy drive (and the replacement HxC Floppy Emulator) I had to revert back to 16.5/33 MHz. I'm using an EtherNEC with both Sting and MiNT. It works well enough to transfer files between my Macs and the Falcon (or from some ftp servers). I added an Eclipse card to have good video perfomances. I'm using it in 1280x1024 65K colors (16 bpp). It's very fast (more that 2000% speed increase in comparison to a standard Falcon). 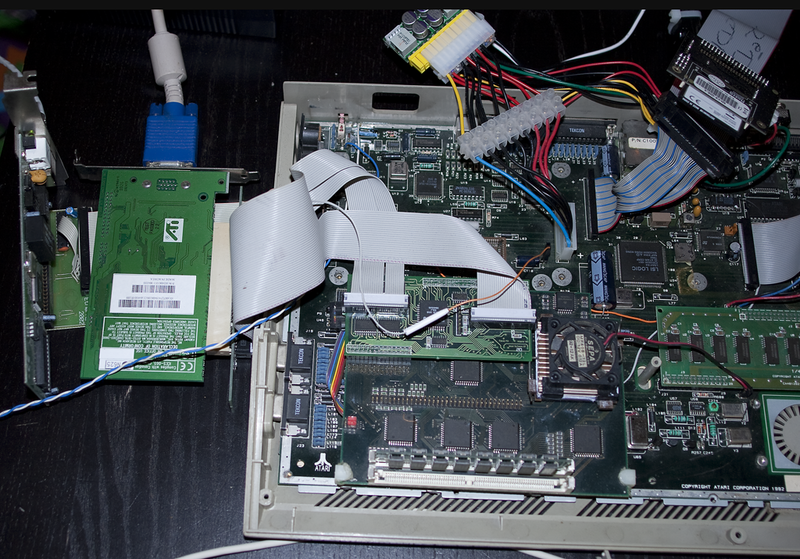 The latest AB040 driver (TKNEW) is working well and allow me to use PCIBIOS. I'm using fVDI v0.968beta4Lgcc-FT2. I changed the power supply for a pico PSU (picoPSU-160-XT) and replaced the harddrive with a compact flash (I use HDDriver). I replaced the floppy drive with an HxC Floppy Emulator...much better. I will need to build a box as for now everything is laying around the original falcon case bottom. 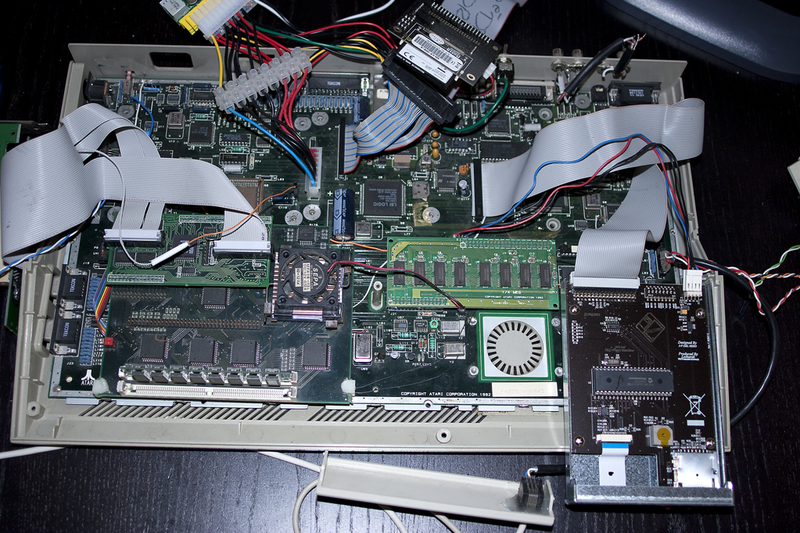 I'm also working on an adapter to put a 68060 on the AB040. First test didn't work and I'm going to produce a 2nd PCB soon. I mostly use it for dev and 'internet' access with the Eclipse and fVDI, or NVDI on the standard VGA output. My disk had a crash and I lost all my MiNT setup so I need to restart from scratch. As I haven't touch this for a while it looks like a lot of progress was done on MiNT and now support ext2fs... a lot better than minixfs. So I'll update this when I get MiNT back up and running.